Saved in the wrong places? 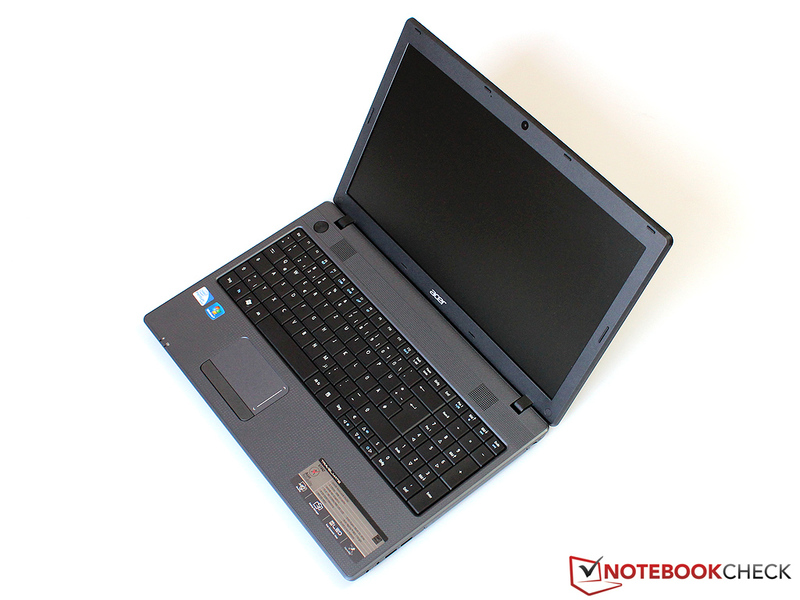 The main thing is cheap – if you don't have any special requirements on a basic Office notebook, you'll find a wide range of offers for around EUR 400. 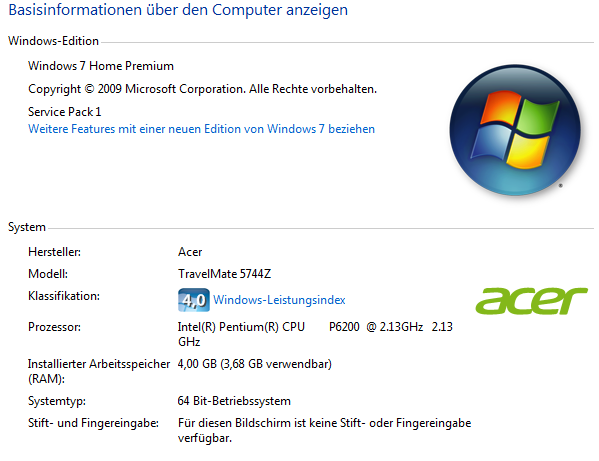 Whether the TravelMate 5744Z from Acer should be put on the shortlist is clarified in this review. Acer's TravelMate range stands for Office devices without frills at a low price. In return, the buyer shouldn't really expect any extravagant design experiments or every last bit of performance. In this review, we take a closer look at the TravelMate 5744Z which is available in various configurations for starting at around EUR 320. While the basic configuration only has a 2 GB RAM besides a Pentium P6200 and a 320 GB hard disk, our test model (5744Z-P624G50Mikk) is equipped with a 4 GB RAM, a 500 GB memory capacity and Windows 7 Home Premium 64bit version for around EUR 400. 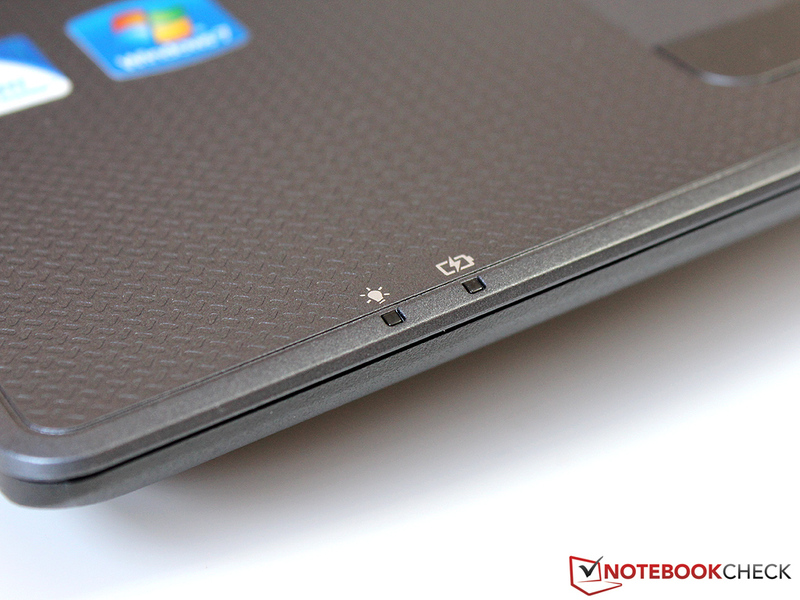 There are a lot of contenders in the 15.6 inch category available at this price. 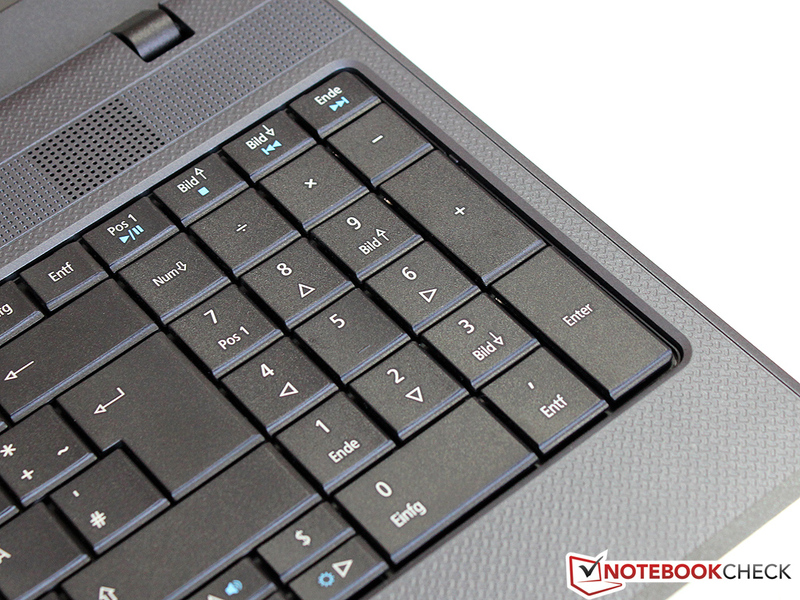 We chose the HP 630 and the Lenovo B570 for comparisons with Acer's candidate. 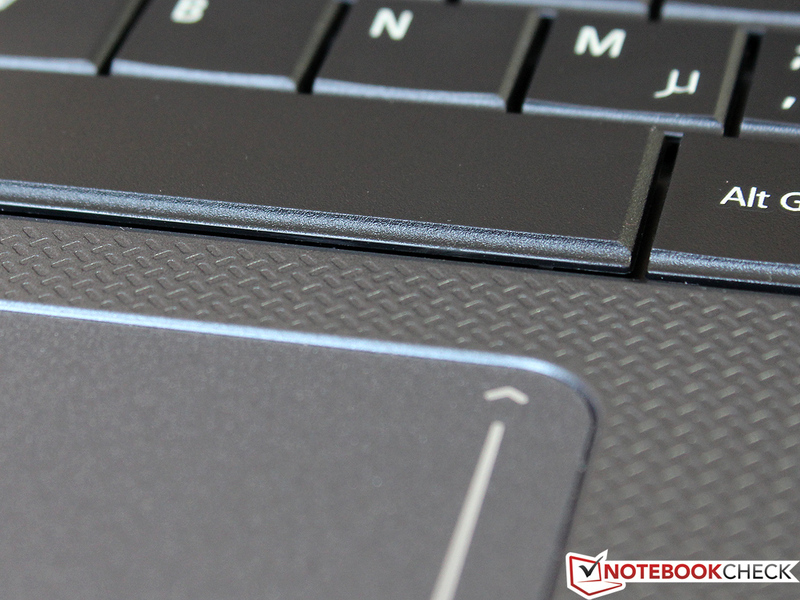 Who offers the best entry level notebook for little money? "Plain and functional", these words best describe the Travelmate's design. 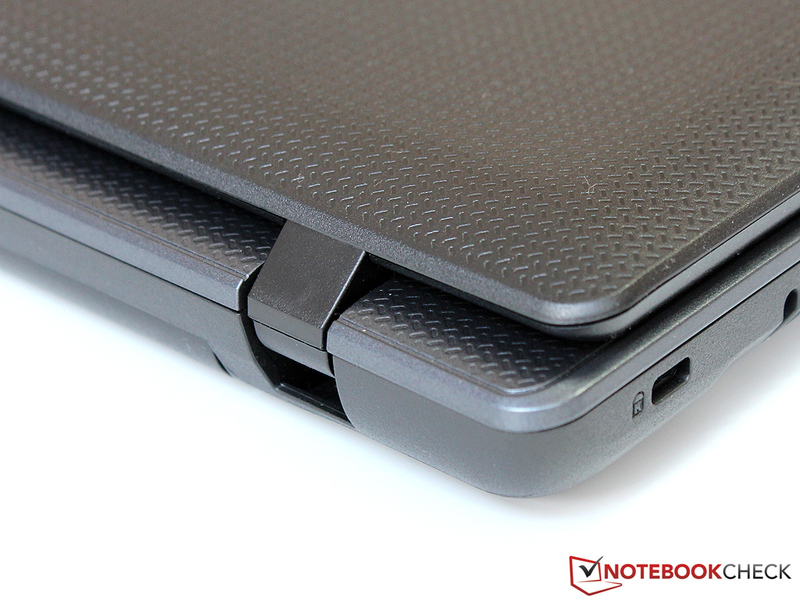 The notebook that looks a bit unwieldy due to its broad bezel is completely made of dark gray plastic. 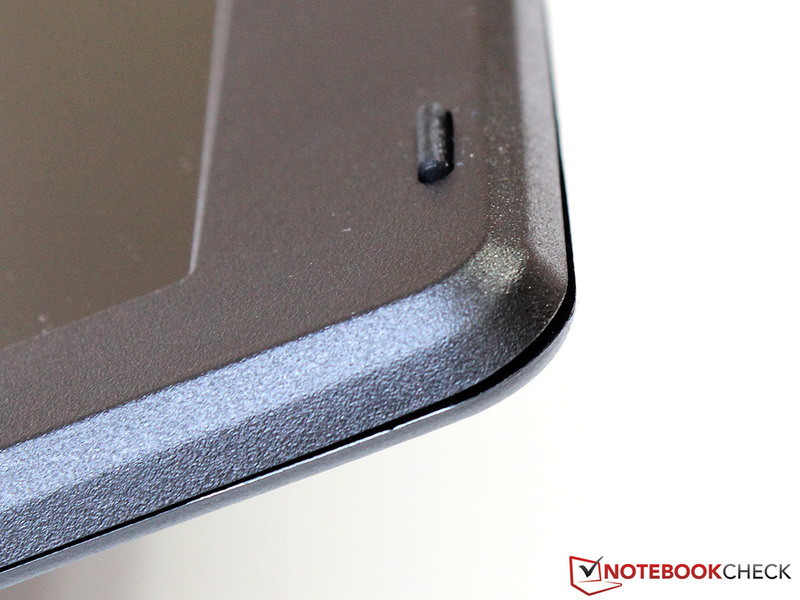 It is slightly textured in some places and Acer fortunately hasn't used any annoying high-gloss surfaces. Although the feel sooner belongs to the category "cheap hard plastic", the case convinces with high stability. Even stronger, selective pressure on typical problem zones, like over the battery or DVD drive, doesn't cause visible deformations. On the other hand, the display doesn't fare as well. It can be twisted obviously despite its thickness and should therefore be opened carefully. The tightly pulled hinges, which make both hands necessary for opening, also contribute to that. However, they regrettably can't prevent the display from teetering. Minor flaws in workmanship become evident when looking closer. We found a few sharp edges and irregular gaps particularly on the display bezel, which show room for improvement in manufacturing tolerances. 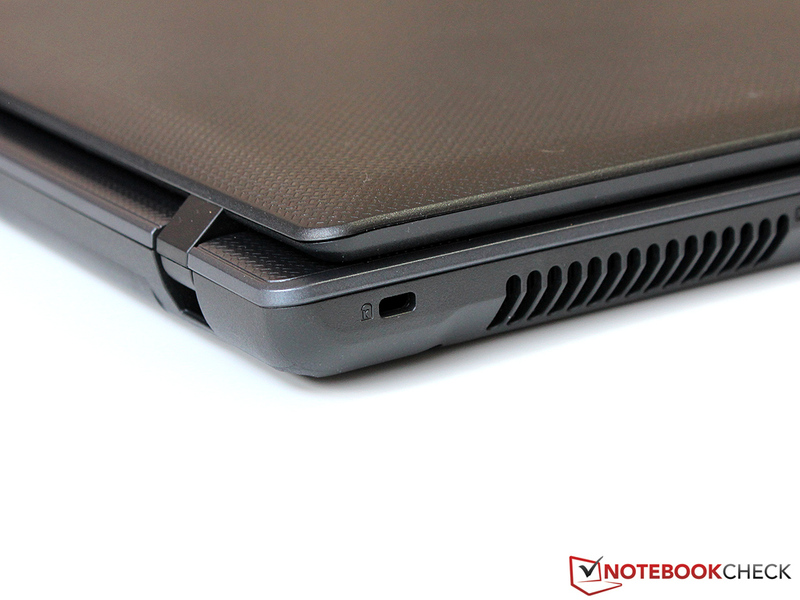 Even if we give the TravelMate credit for its competitive price, the given workmanship isn't a feat compared to the competition from HP and Lenovo. Corresponding to the low-cost sector, the connectivity of the 5744Z is rather meek: Three USB 2.0 ports have to suffice for connecting additional peripherals and an external monitor can only be connected via the analog VGA port. 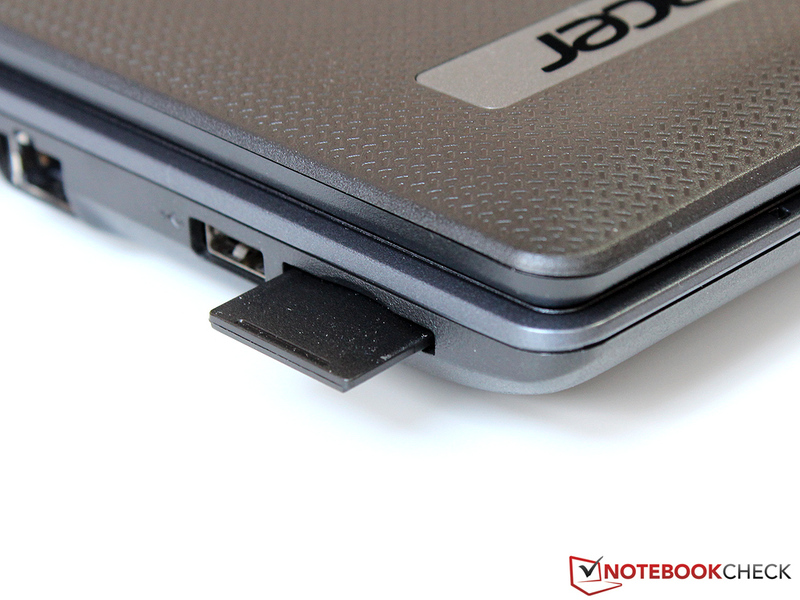 USB 3.0 and even HDMI have been omitted due to cost reasons right away. The Fast Ethernet interface can be called outdated. At least this rather meager supply is complemented by a 2in1 memory card reader (SD / MMC), a Kensington lock and headphone and microphone sockets (3.5 millimeter jack). We also have to criticize the positioning of the single ports. Because they are concentrated in the front area of both the left and right side of the case, an unobtrusive cable routing is hardly possible. 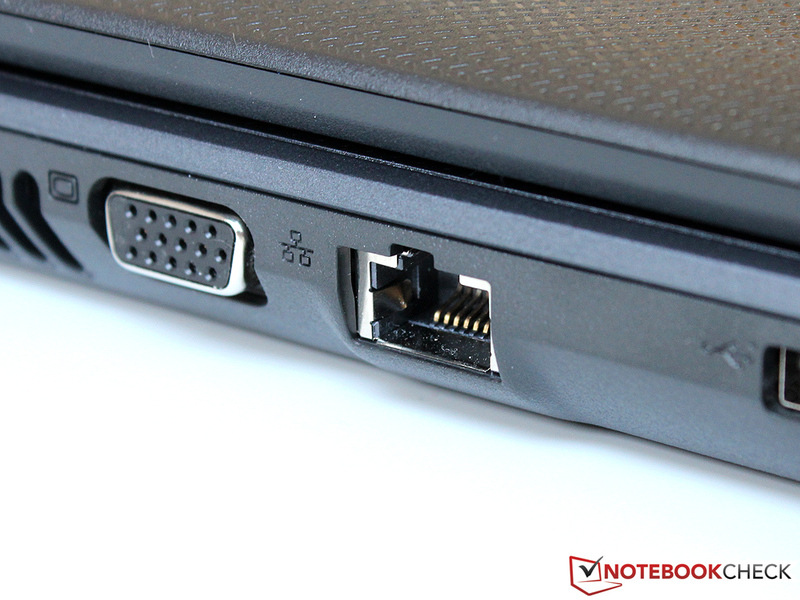 It would have been better had Acer placed the LAN or VGA port on the interface-free rear, for example. 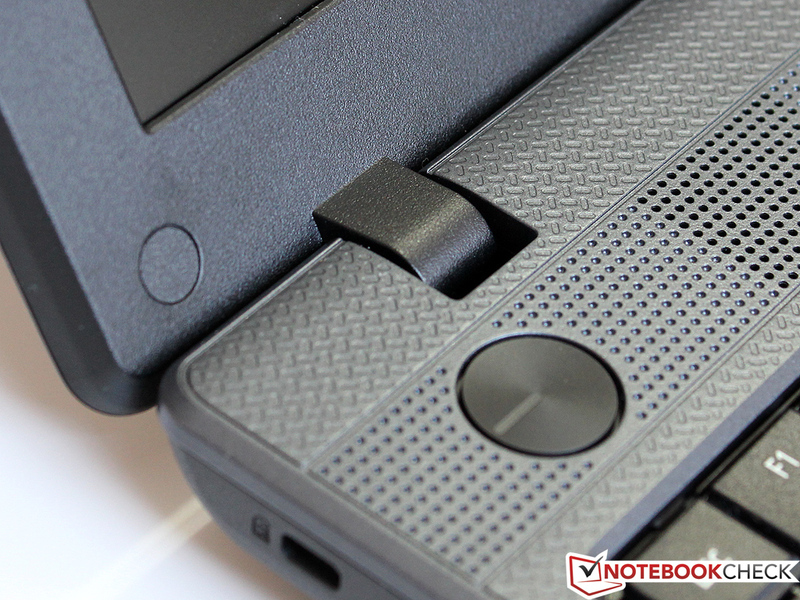 However, this is just as little the case in Lenovo's B570 or HP's 630. A wifi module from Atheros (AR5B125) takes care of connecting to 2.4 GHz wireless networks in standard 802.11 b/g/n. 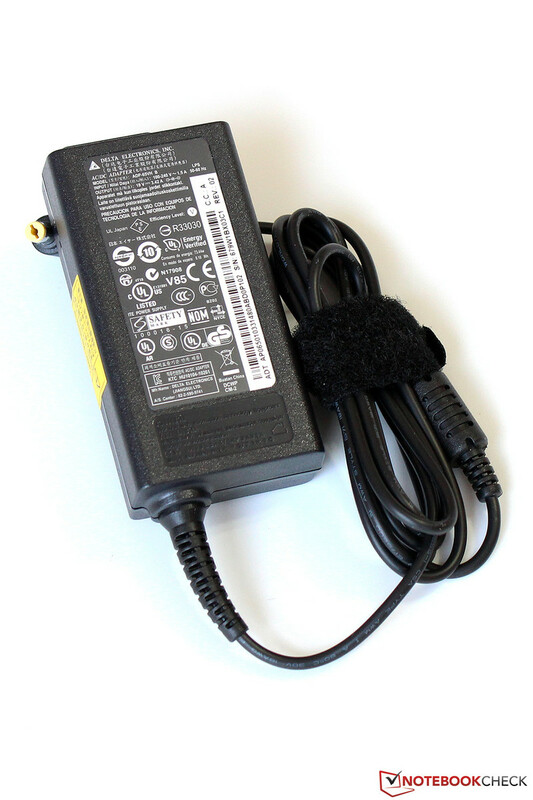 Although the adapter comes from the entry-level sector, it convinces with a very far range and a stable connection. Unfortunately, Bluetooth isn't installed. The user would have to use an additional USB flash drive where required. The 1.3 megapixel webcam, built into the display bezel, produces useful results even in weak lighting conditions. Alike the corresponding microphone, the quality is sufficient for video chats or a quick snapshot. However, it won't satisfy any requirements that go beyond that. A few brochures, the notebook, the power adapter and the battery - that's all that we found in the scope of delivery. The manufacturer pre-installs DVD player software (Corel WinDVD), a webcam application and an anti-virus bundle from McAfee. The user can access the innards of the TravelMate 5744Z via the maintenance cover, which is secured with several screws. The hard disk can be swapped or the working memory can be upgraded via an unoccupied slot with a few easy steps. 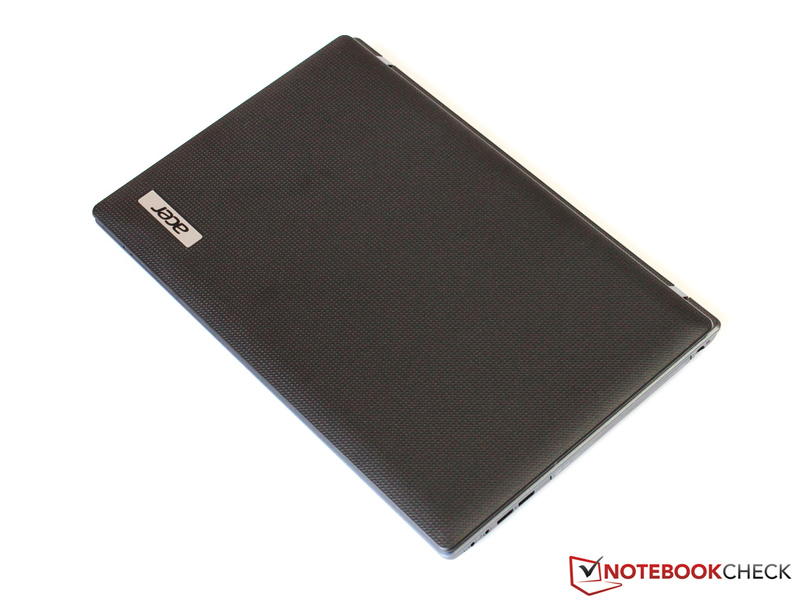 While many manufacturers only give their notebooks a 12 month warranty nowadays, Acer treats even its low-cost entry-level models to twice the time with a period of 2 years. Potential customers should carefully consider whether investing an additional EUR 79 for an extension to a 3 year bring-in service is worthwhile in this price range. Cost-cutting measures can be accepted in many areas of a low-priced Office laptop - but not in input devices. Acer has configured the 15.6 inch case with a full-fledged keyboard - including a number pad - which for once isn't made in a chiclet design. It allows using especially large letter keys with an edge length of 18 millimeters and thus corresponds to most desktop keyboards. The layout itself is generally unremarkable; merely the additional keys for the € and $ sign catch the eye. It doesn't take long even for touch-typists to get used to the TravelMate because of its agreeably large keys that have a slightly textured surface. The short key drop and a firm, but not very precisely defined pressure point, don't exactly convey an impression of highest quality. The clattery typing noise even reinforces this. We can thus note that you can type quickly and accurately on the 5744Z despite this basically mixed presentation. The touchpad from Synaptics has a size of only 46 x 87 millimeters and could have therefore been a bit bigger. The additional scroll field at the pad's right edge limits the functional input area even more. That forces the user to reposition the finger frequently. The user can fall back on the corresponding multi-touch gesture as an alternative. We can only praise the other features of the slightly roughened surface: Perfect gliding traits and an above average precision aren't a matter of course. 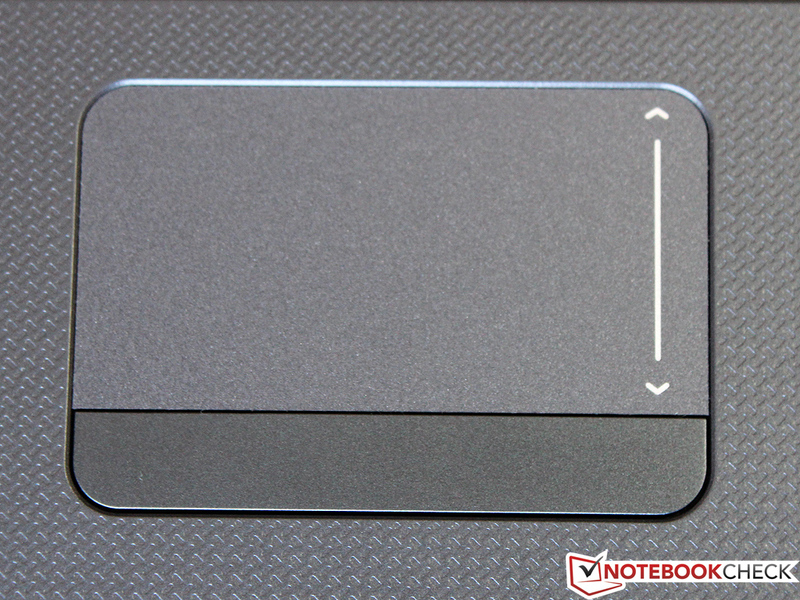 A single bar below the touchpad takes over the function of the two mouse buttons. Depending on the position, the stop and the click noise are sometimes more and sometimes less spongy. It leaves us with a somewhat divided impression. 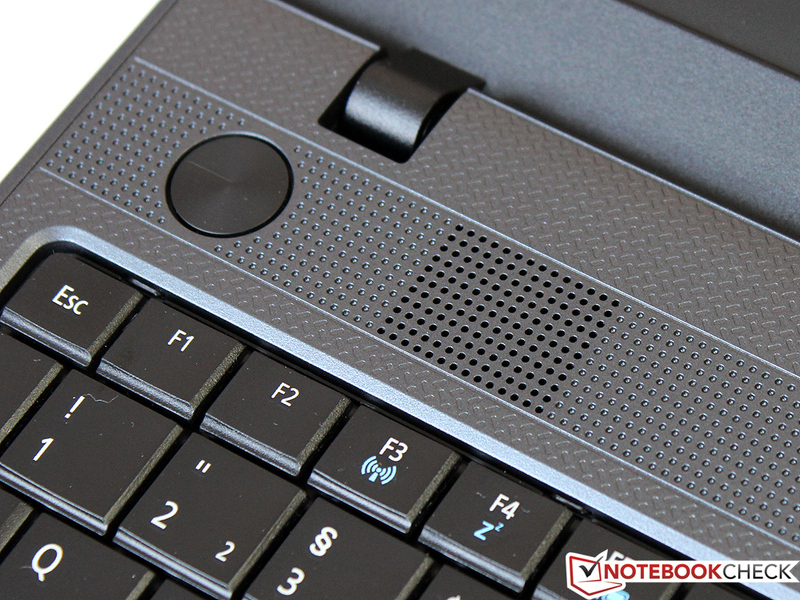 In terms of both keyboard and mouse replacement, the Lenovo B570 clearly offers the superior input devices. 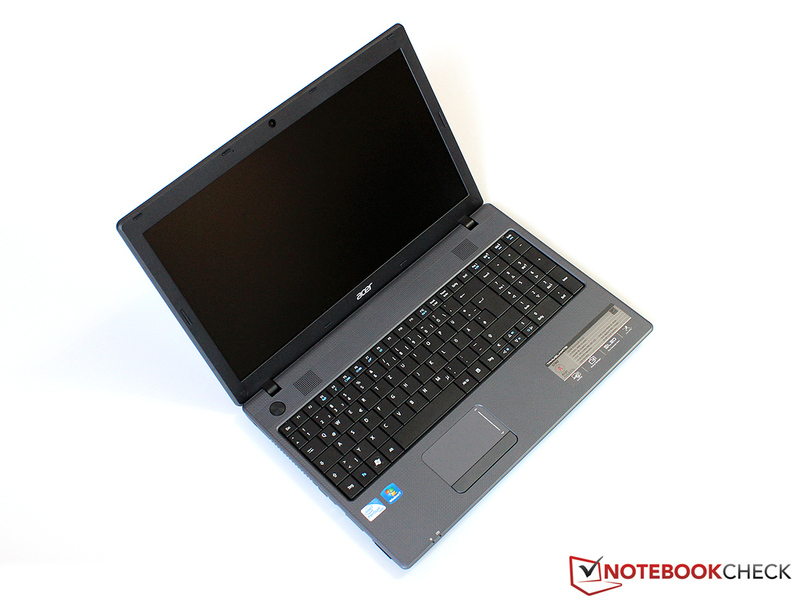 The TravelMate 5744Z unfortunately doesn't surpass the category standard of 1366 x 768 pixels common for most low-cost 15.6 inch notebooks. 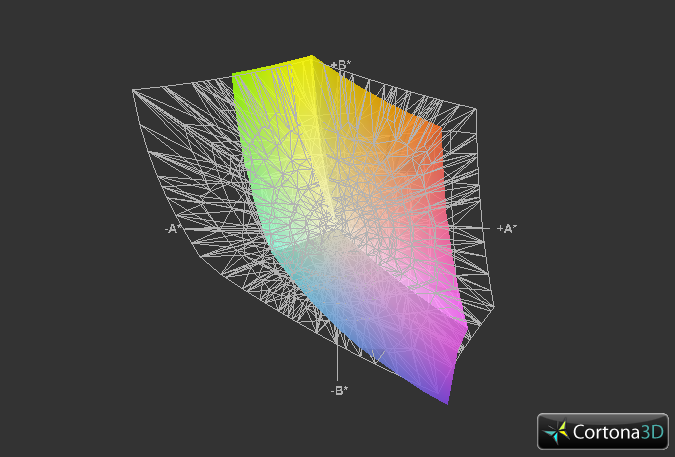 Consequently, it amounts to an equally common pixel density of 100 dpi. 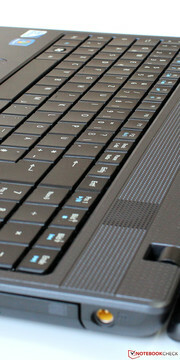 Compared to a Full HD screen, the available desktop surface is thus only about half the size. On the subject of brightness, the LED backlit display disappoints with weak 174 cd/m2. 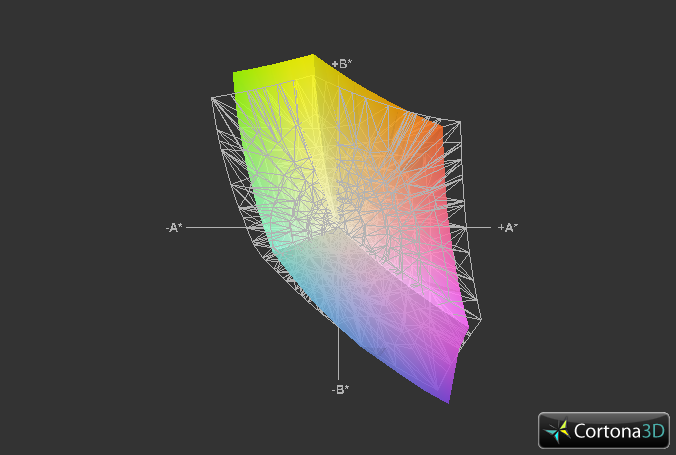 This could also prove to be too little indoors, depending on the additional light sources. It will hardly be a surprise that the black value and the resulting contrast are sooner moderate. We determined 0.89 cd/m2 and consequently a ratio of 193:1, which is a typical rate for a low-end screen (AUO B156XW02 V3) based on the TN technology. 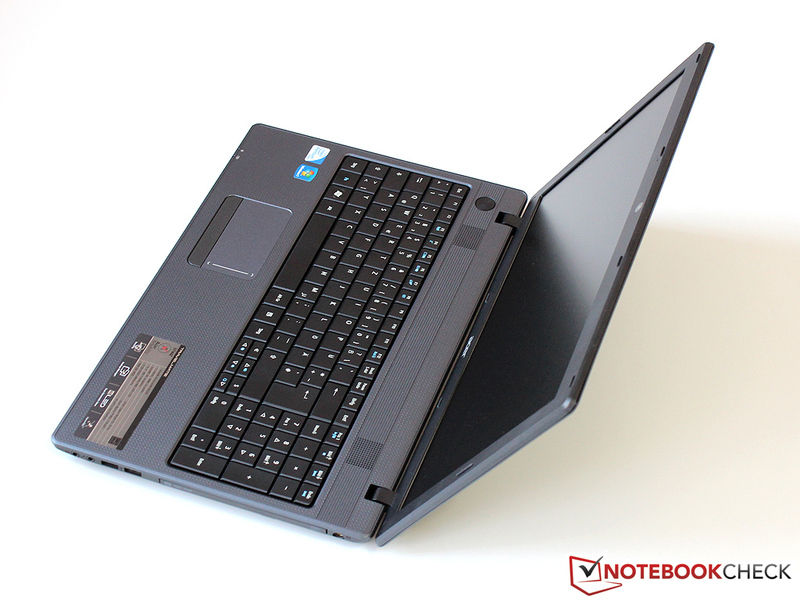 Both the Lenovo B570 and the HP 630 had approximately the same rates in previous tests. 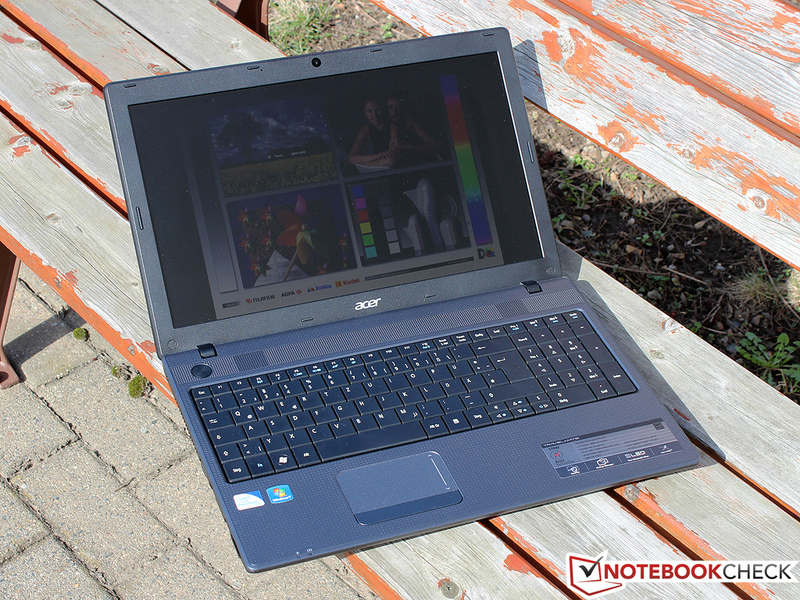 The color spectrum, vital for graphic designing, is quite low in Acer's laptop. Thus, the device is disqualified for such applications. Non-professional users will hardly be affected by this restriction, especially since first much more expensive models achieve clearly better outputs. 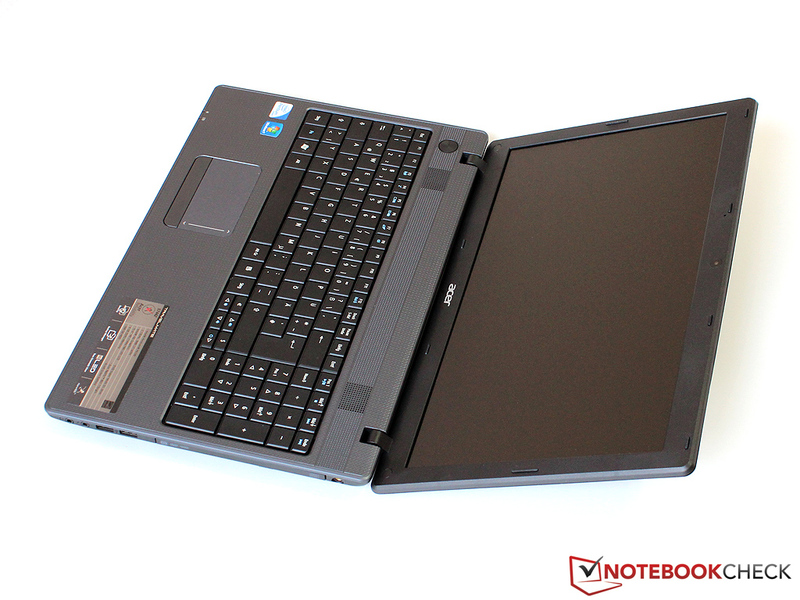 A non-glare screen surface is used in the 5744Z as is appropriate for an Office device. Annoying reflections are thus effectively prevented, although the screen's low brightness thwarts a truly perfect outdoor suitability. The picture can still be recognized quite well in the shade, but the laptop fails in bright sunlight. Rates of 250 cd/m2 and higher would be necessary for this. However, only very few devices in the EUR 500 price range achieve this. Although only an absolute centered viewing position in front of the screen ensures a true rendition of the displayed content, at least we can confirm our test device to have a certain viewing angle stability horizontally. On the other hand, deviations of a few degrees upward or downward result in a visible fading, respectively dimming. This can only be remedied by readjusting the opening angle. Due to the lack of a digital port, only the VGA port can be used for connecting an external monitor. The quality of the analog signal is exceptionally good; the picture is characterized by high sharpness and a slight tendency to flicker. 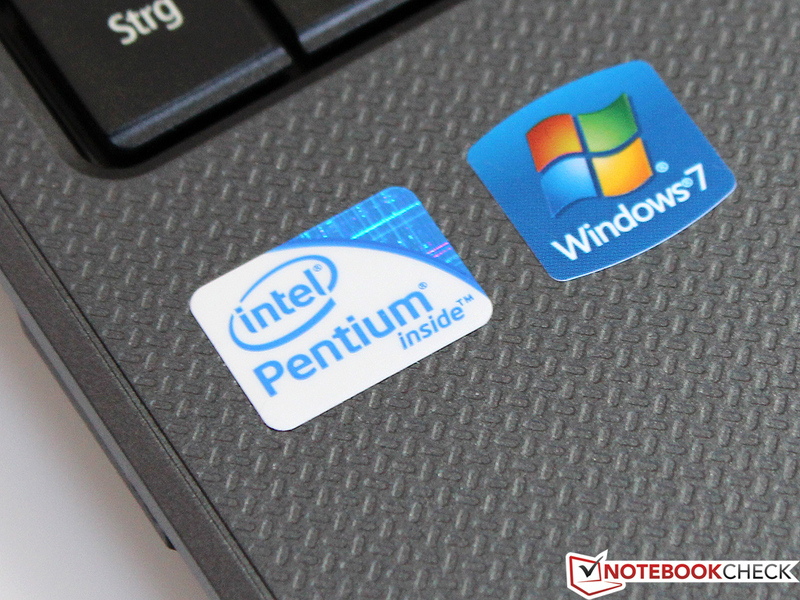 The Pentium P6200 originates from the over two year old Arrandale architecture, which was replaced by its successor, Sandy Bridge, at the beginning of 2011. Thus, the buyer has to live without the modern AVX instructions. 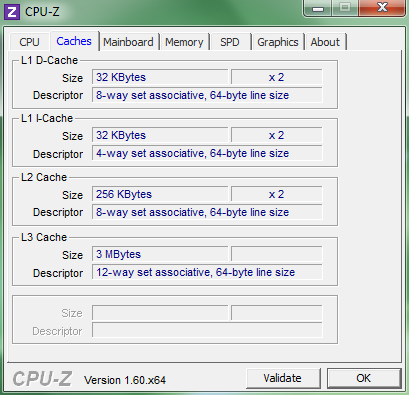 Moreover, the 2.13 GHz dual core processor supports neither Turbo Boost nor Hyper Threading. 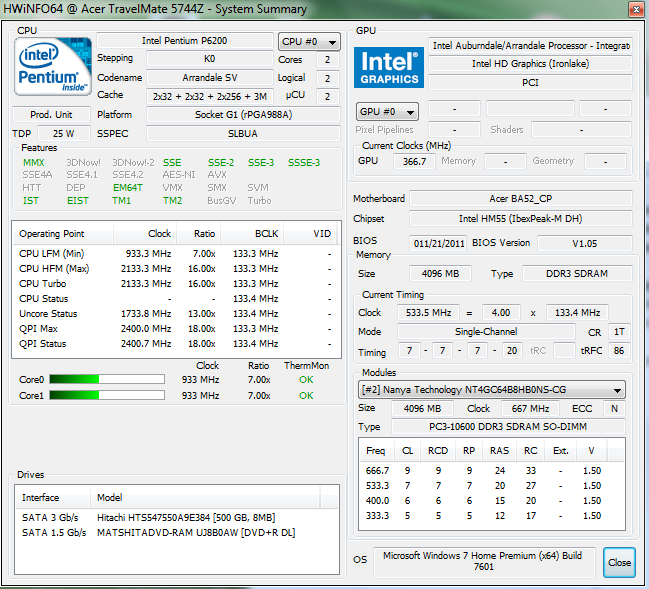 Intel specifies a TDP of 35 watts, although the real full load consumption will likely be much lower. 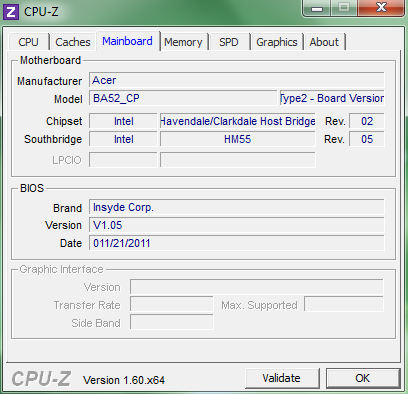 The DDR3 memory controller and the DirectX 10 capable Intel GMA HD Graphics are implemented on a second chip in the MCM bundle of the P6200. 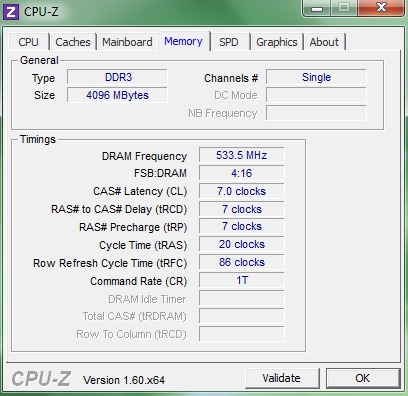 It clocks with 500 MHz (Turbo up to 667 MHz). A record-breaking performance shouldn't be expected here. However, normal Office applications shouldn't cause problems in connection with a 4 GB RAM (one module) and a 500 GB hard disk. The weak benchmark results in Cinebench make it obvious that the Pentium P6200 is located in the entry-level sector. 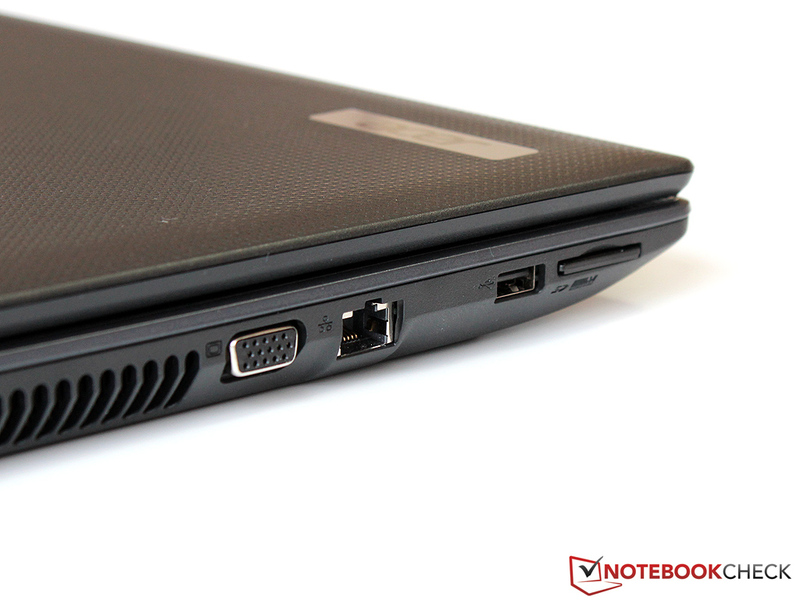 A score of 1.4 points in the latest R11.5 version is in front of the E-450, found in the even cheaper HP Compaq Presario CQ57, by more than 100 percent. 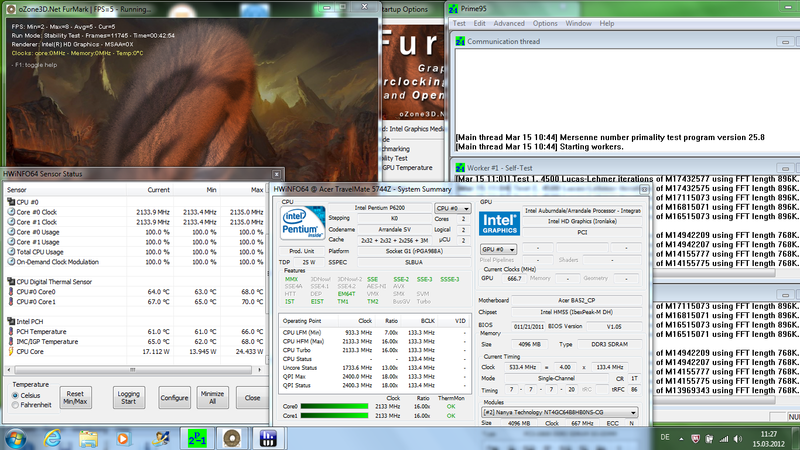 On the other hand however, a midrange model like the Core i3-2330M in the Lenovo B570 is over 50 percent faster. This difference is a bit lower in the single thread assessment because the Core i3's Hyper Threading is disabled. The Hitachi hard disk (HTS547550A9E384) bids a memory capacity of 500 GB at a speed of 5400 rpm and has an 8 MB cache. 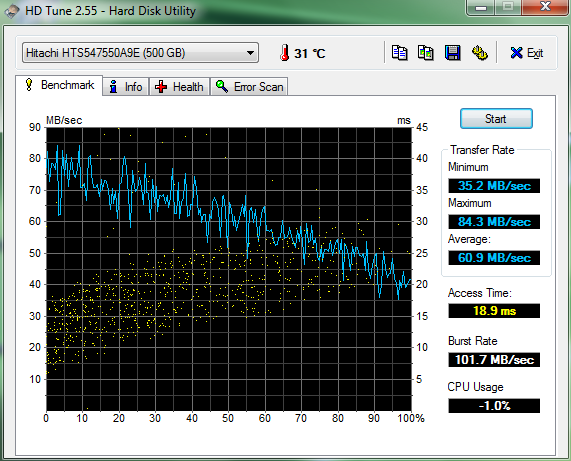 The drive places itself in the midfield with a typical, average transfer rate of 60.9 MB/s (HDTune). 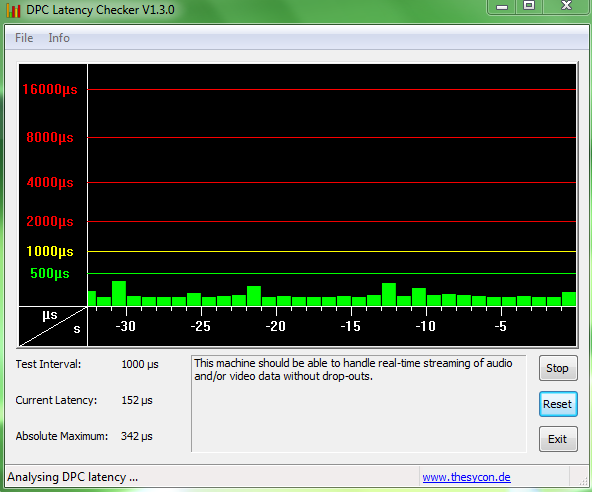 The access speed of 18.9 milliseconds also doesn't stick out in the crowd. The booting process takes accordingly long and consumes approximately 40 seconds. The rather moderate score of both processor and hard disk logically also have an impact on the system performance. The TravelMate 5744Z wins the duel with a similarly configured HP 630 (3598 to 4329 points) in PCMark Vantage. However, it loses marginally in the newer PCMark 7 (1131 to 1062 points). 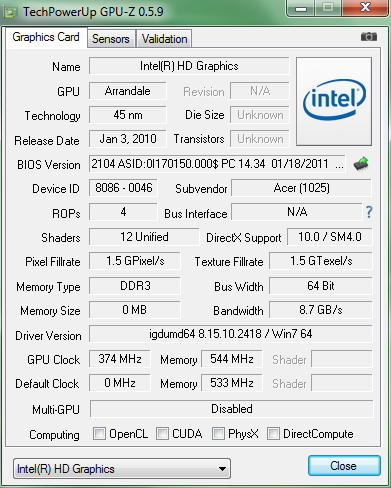 The Lenovo B570 shows just how much a faster CPU can speed up this result (4613, respectively 1816). So not to make the wrong impression: The available performance reserves are easily sufficient for word processing, surfing on the Internet or even editing vacation pictures. However, the buyer should consider that investing a bit more money can result in a big gain of performance and thus also a longer life expectancy of the laptop. Marketing terms like "Turbo" or "HD" in the name or on the list of features of the GMA HD Graphics shouldn't belie the fact that this chip is an absolute low-end model of the past generation. Movies or trailers with a resolution of up to 1080p can be accelerated by the video decoder and also be rendered smoothly. However, the 3D performance is extremely low. Merely 1408 points in 3DMark 06 (Performance preset), so less than a Radeon HD 6250 from the netbook sector, speak for themselves. 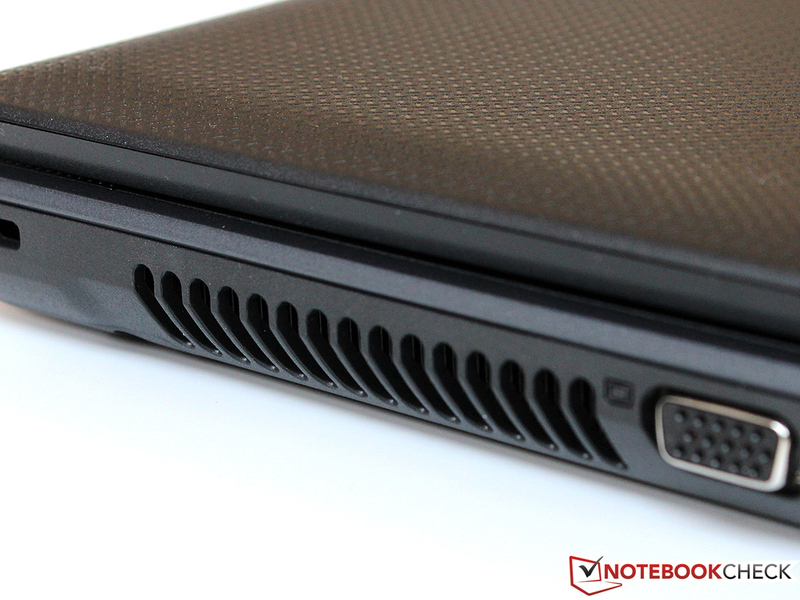 The notebook is hardly suitable for up to date games because it doesn't have a dedicated graphics card. Therefore, we will only make a side note of this point. Even the technically undemanding soccer simulation, Fifa 12, only runs consistently smoothly with at most 800 x 600 pixels and minimum details. The graphically elaborate building strategy game, Anno 2070, ends up as a slide show even in our lowest pre-settings. The noise development of the TravelMate can be called exemplary. The fan is usually completely disabled when idling and is only activated occasionally during low load. The resulting noise of 29.6 to 32.0 dB (A) is particularly dominated by the subtle noise generated by the HDD. The notebook remains quiet with 32.0 dB (A) during full load in 3DMark 06 and will hardly attract negative attention. We could only measure a somewhat higher rate of up to 36.2 dB (A) in our unrealistic stress test (Prime95 and FurMark). 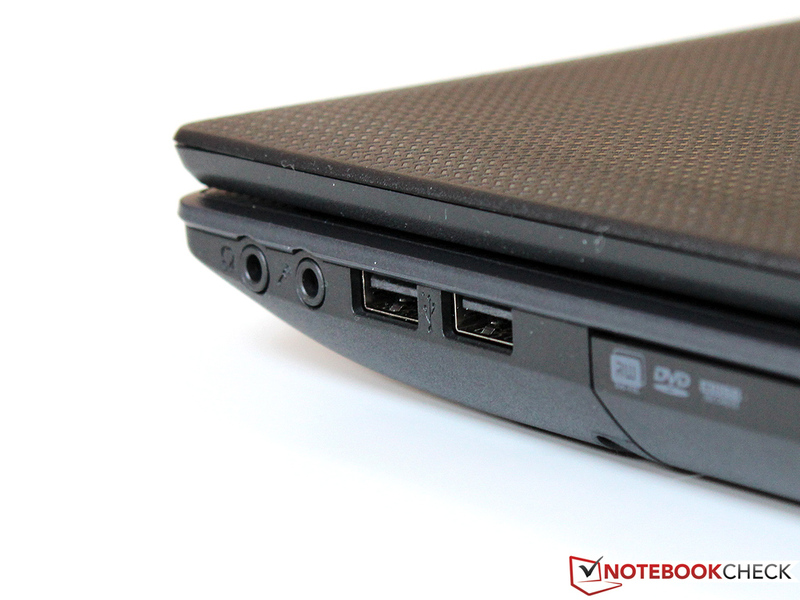 We wouldn't recommend using the notebook for playing DVDs: The drive doesn't exactly belong to the quietest of its kind and accompanies movie enjoyment with a loud hum. No matter if simple word processing or high processing load, the surface temperatures of the 5744Z barely change. Our infrared-thermometer recorded slightly fluctuating rates of 28 to 30 degrees Celsius on both the top as well as the bottom of the device. This indicates an efficient cooling management, respectively energy-efficient components. This theory is backed by the processor's low core temperature. 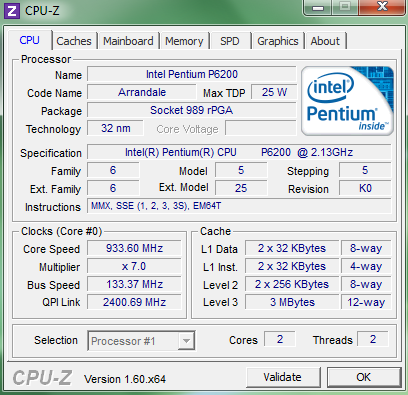 The Pentium P6100 reached a maximum of around 70 degrees Celsius. That is far below the maximum rate of 90 degrees Celsius specified by the manufacturer. We couldn't determine throttling in either the CPU or GPU. According to the program HWiNFO64, both remained at their maximum clock rate of 2133, respectively 666 MHz (Turbo enabled). (+) The average temperature for the upper side under maximal load is 28 °C / 82 F, compared to the average of 29.4 °C / 85 F for the devices in the class Office. (+) The maximum temperature on the upper side is 31.1 °C / 88 F, compared to the average of 33.9 °C / 93 F, ranging from 21.2 to 62.5 °C for the class Office. (+) In idle usage, the average temperature for the upper side is 28.6 °C / 83 F, compared to the device average of 29.4 °C / 85 F.
(-) The average temperature of the palmrest area of similar devices was 28.2 °C / 82.8 F (-5.5 °C / -9.9 F). The small stereo speakers will definitely not cause cries of enthusiasm. 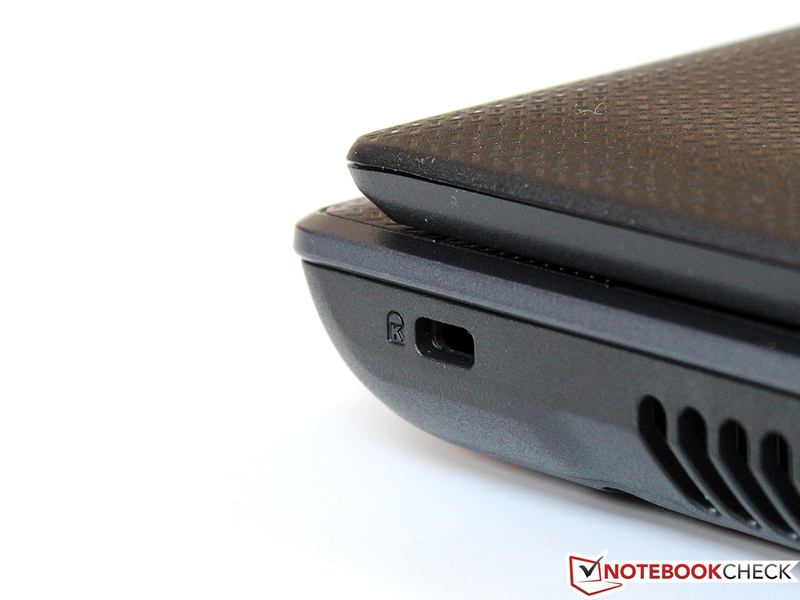 However, the playback quality can certainly be described as satisfactory for an Office notebook. Acer has fortunately not installed any useless sound enhancers, allowing for a fairly neutral sound - when we disregard the largely non-existent bass range. The main point of complaint is the too low maximum volume, which doesn't quite reach the level of a conversation held at a normal tone of voice. Superior speakers can be connected via the headphone jack. 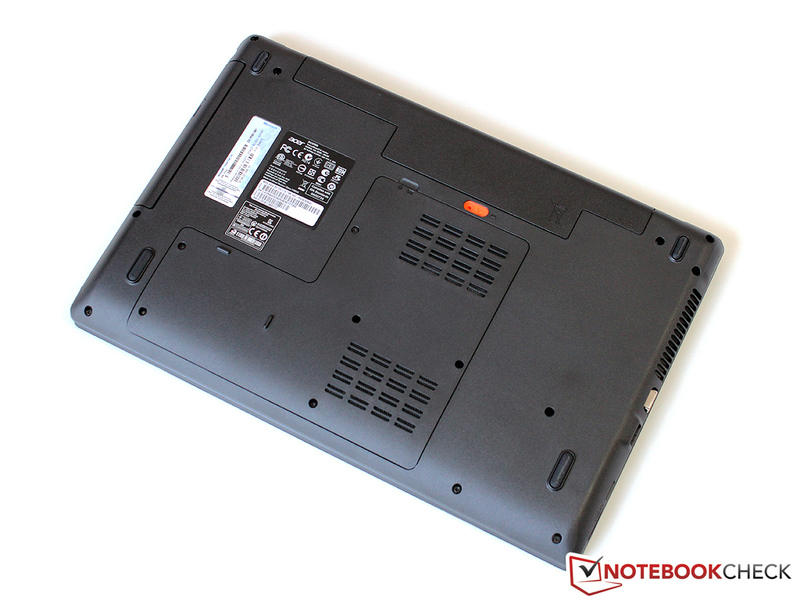 Notebooks based on Sandy Bridge, such as the Lenovo B570, excel with a minimum power consumption of frequently only 6 to 7 watts. The Acer model with the older Arrandale platform fails such regions clearly. Idling rates between 10 and 16.5 watts don't sound like much when seen as a whole. That is outdated, however, when compared to other, partly much stronger devices. 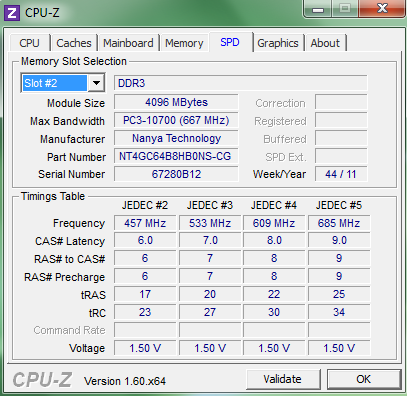 The consumption increases to an acceptable 30.7 watts during a 3DMark 06 run. We could determine a maximum of up to 48.1 watts, so the compact 65 watt power adapter will be able to cope with that easily. The comparatively high power consumption, particularly during lower load, is reflected in a rather short battery life. Almost 5 hours of runtime (BatteryEater's Reader's test) with maximum energy saving settings shrink to only 2 hours in our practical wifi test (150 cd/m2). That isn't exactly a feat for a notebook with a 48 Wh battery. The TravelMate had to be connected to the outlet again after only 86 minutes during load (BatteryEater's Classic test). There's no way around making compromises in a notebook of the EUR 400 price range - but it is important where they are made. 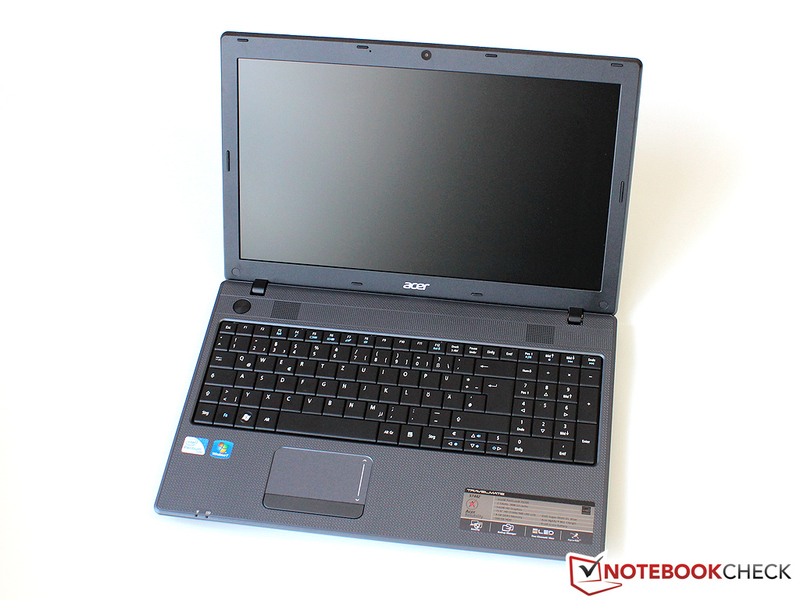 We'd like to begin with the positive qualities of the Acer TravelMate 5744Z: Although the built-in processor is technically on the stand of early 2010, the application performance should be sufficient for a simple Office device. 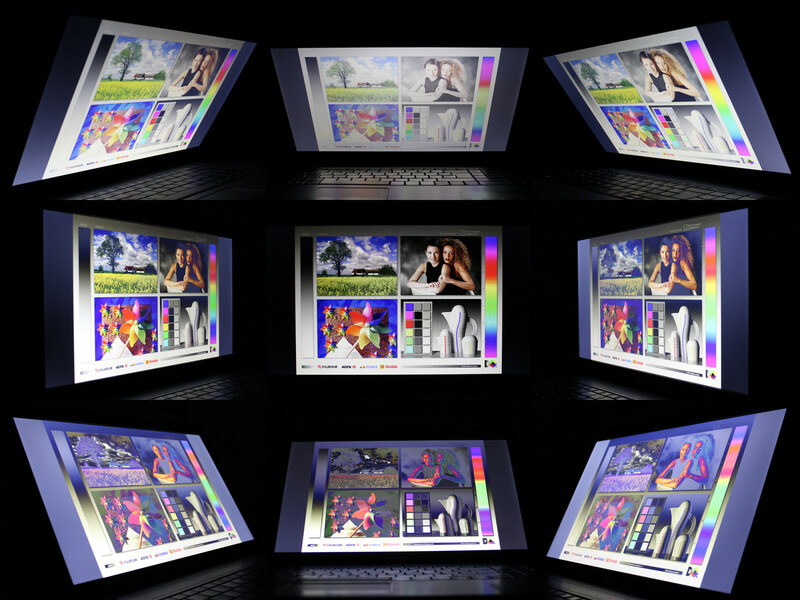 The notebook doesn't have any difficulties with routine tasks, at least as long as 3D performance isn't a requirement. The case stability and the low noise development are also on the pro side. You will have to live with the label "plastic bombshell" that is common for all entry-level models. Nevertheless, we would expect it to be well-manufactured. The Acer shows a few weaknesses here and presents itself with protruding edges and irregular gaps. That leads to deductions, just like the weak luminosity of the matte screen and short battery runtime. 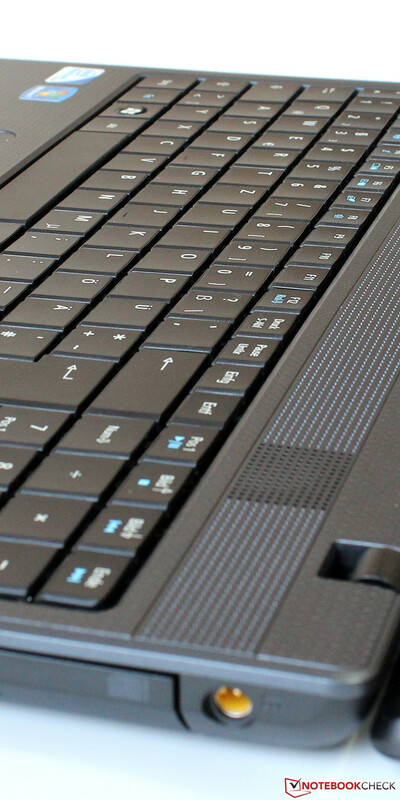 Although the tested configurations of the Lenovo and HP models are now hard to find, various follow-up models could prove to be interesting alternatives. The HP 630 with a Pentium B950 of the Sandy Bridge generation is currently available with 4 GB of RAM, a 500 GB memory capacity and Windows 7 for less than EUR 400 - and could possibly be the better option. At least it has a Kensington lock. Unusual: There is no hard disk LED. but the Pentium P6200 is sufficient for many applications. The cooling also works quietly and in the background during load. A bit clattery: Keyboard with number pad. The name "loud"speakers seems to apply to the 5744Z only to an extent. Upgrading the RAM and HDD is possible via a maintenance cover. USB 2.0 is outdated in 2012. That regrettably can't be said about the connectivity. 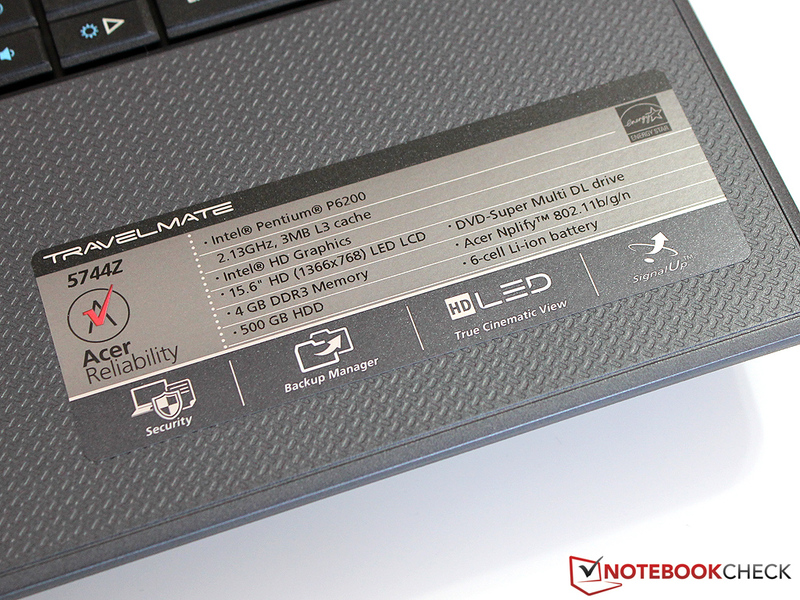 Acer could improve the manufacturing quality. that teeter on vibrating surfaces. The maximum opening angle is generous. The power adapter can easily cope with the maximum consumption due to 65 watts. 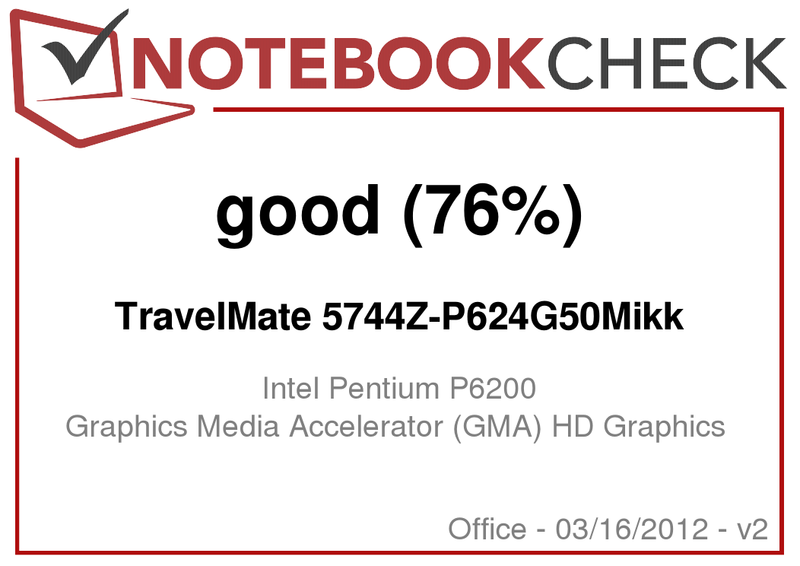 Awesome performance records are absolutely irrelevant for many tasks - the cheap Pentium processor is appropriately sized for word processing & co. The manufacturer can invest the saved money somewhere else. 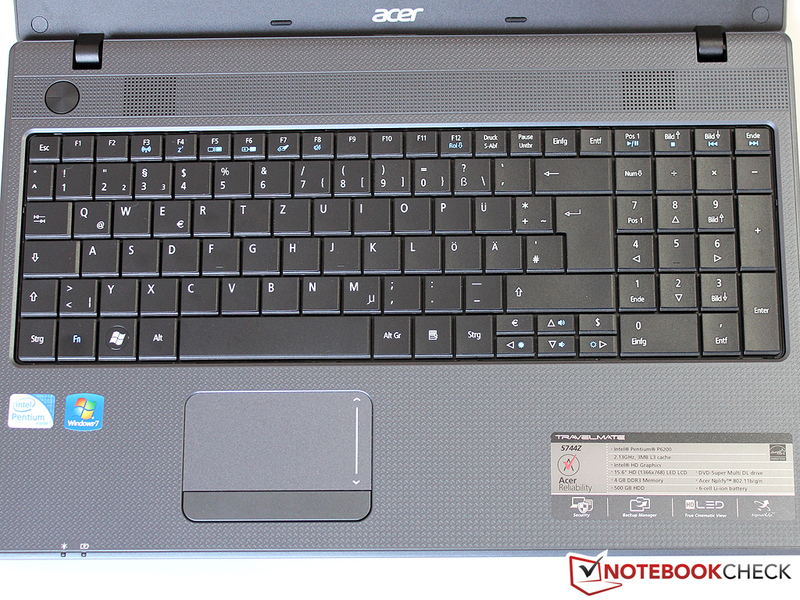 ... is an improvement in the display and workmanship, which Acer has unfortunately neglected. We expect a certain standard of quality even from entry-level models. Although there is only a difference of one generation between the Sandy Bridge and Arrandale architecture, the differences in power consumption and battery life are gigantic. The successor is definitely worth its (minor) surcharge. The HP 630 for less than EUR 400 available with updated hardware is a real insider tip in the meantime. 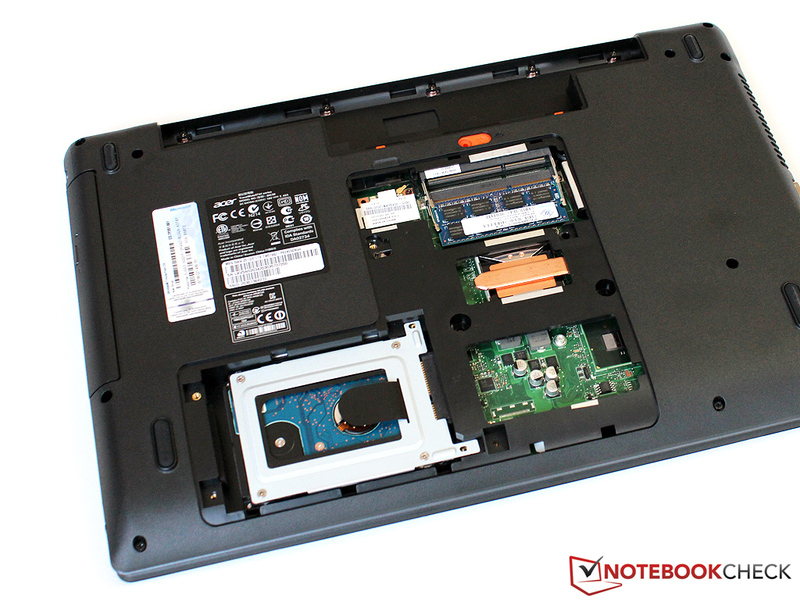 If you are willing to invest a bit more money, you should take a closer look at the Asus P53E and the Lenovo B570 (both with Core i3).